London’s prestigious department store, Harrods, has started selling some very special chocolate from Trinidad. 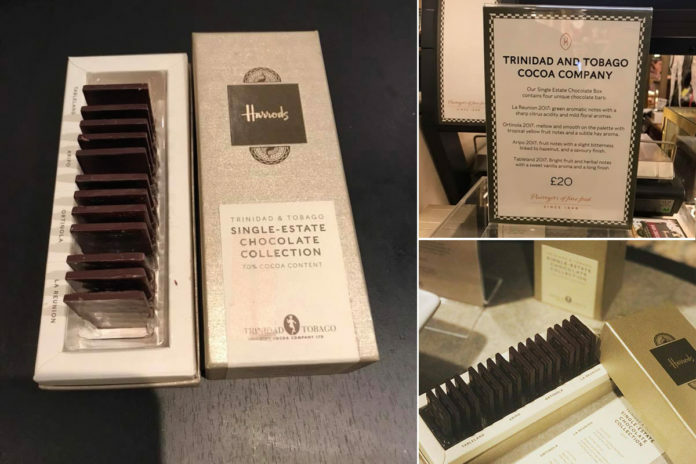 It was at the start of National Chocolate Week in October that Harrods began to offer the Trinidad & Tobago Chocolate Company’s Single Estate Chocolate Box. The selection contains four bars of chocolate, each made from the same type of bean (Trinitario) but grown on different estates, so each has a unique and distinctive flavour. From the government-run La Reunion estate, for example, the chocolate has “green aromatic notes with a sharp citric acidity and mild floral aromas”. Chocolate from the historic Ortinola estate is “mellow and smooth on the palette with tropical yellow fruit notes and a subtle hay aroma”, while “dried fruit notes with a slight bitterness linked to hazelnut, and a savoury finish” distinguish Aripo’s product. Finally, “bright fruit and herbal notes with a sweet vanilla aroma and a long finish” are the hallmarks of the brand-new Tableland estate’s chocolate. So this is definitely not your standard supermarket bar – it’s a treat for the connoisseur! The Trinidad & Tobago Chocolate Company was set up six years ago to try to reverse the decline in cocoa growing. At one time, Trinidad exported 30,000 tonnes of cocoa a year, whereas today the country produces only 500 tonnes. The sector is fragmented, so the company is trying to help farmers through setting standards and providing guidance. The gleaming new processing plant at La Reunion has all the latest technology to ensure the end product satisfies the most demanding international consumers. The quality has to be high, because the small scale of production means Trinidadian chocolate will never be cheap. In an interview with Loop, company director Ashley Parasram said recently, “We aren’t really selling chocolate, we are selling T&T.” He has hit on an ingenious way of doing just that – packing chocolate in steelpan-shaped tins. They sell for TT$150 locally; the Harrods box retails at £20. 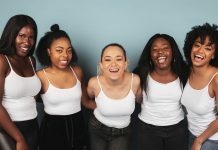 T&T Chocolate Company clearly sees Britain as the gateway to new overseas markets for its premium products, as it has developed partnerships, talks and tastings with celebrity chef Gordon Ramsay, Leiths School of Food and Wine and the Artisan du Chocolat store in Notting Hill. With La Reunion’s production set to expand from 50 tonnes to 100 tonnes by 2020, there should be more of the sweetness to share – but only if you’re really feeling generous!